Kindly send hard copy of your applications to Dr. Manjusha Dake, Dr. D. Y. Patil Biotechnology and Bioinformatics Institute, Survey No. 87/88, Mumbai-Bangalore Expressway, Tathawade, Pune 411033. Highlight the envelope with “Application for post of Project Fellow Post code: PBL-01MSD”. No TA/DA will be paid for attending the interview. Applications received by email will not be considered. Cover letter should be signed by the candidate. 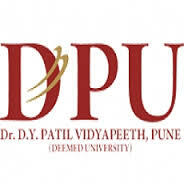 Dr. D. Y. Patil Vidyapeeth, Pune (DPU) recruits Project Fellow Post. Candidate with B.Tech /M. Tech., M.Sc. can apply. Education is much more than the mere collection and distribution of knowledge. It offers intellectual hospitality, opportunities for innovation, creativity; power of thought and imagination. It envisages development of character and inculcation of a firmness of mind and zeal to offer one’s best to the world. Education is the means of unfolding moral and spiritual potentialities of men.